Personally, I absolutely hate using the word "free". I think it's an overused, unimaginative trick to get people's attention. But sometimes, free is still one of the best words to use. Especially when you're offering something of value... for free! So here are some sign design tools, services, business reports and other goodies for you... on the house! This one-of-a-kind tool will help you pinpoint the best type of material to use for your particular project. This interactive guide will ask you a few short, non-personal questions. These are the identical questions we ask clients during a one-on-one consultation. Once we know a client's situation, we can provide specific recommendations. Sometimes, all you want is the bottom line! "How much?" And "What does that price include?" This online pricing calculator will instantly show you prices, sizes, options & more! What size should the letters on your custom signage be so that it's readable from a distance? This handy Letter Sizing Calculator removes all the guesswork. When it comes to choosing sizes, most people seem a bit lost. I can see it in their faces. They just don't know how to go about it mathematically. So they take their best guess and hope the sign will turn out okay. However, hope is not a strategy. 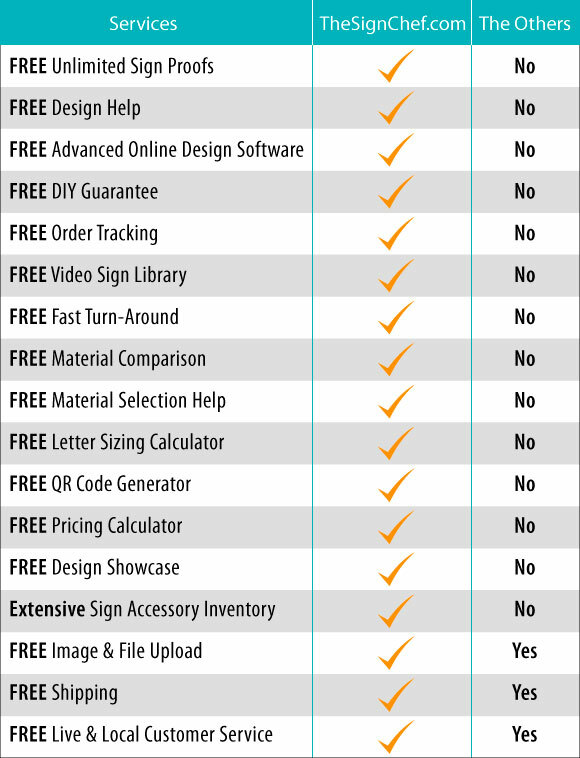 "How can I make sure I'll be completely satisfied with my new signs- before I buy?" With SignMagic, you can literally custom design your own sign or banner online. Any time, day or night. You don't have to wait on anyone else to do anything, for you. And you don't have to worry about anybody rushing you either! You can take all the time you need to carefully review your options including: The size of the letter, which letter styles look the best to you, seeing how different colors & combinations look, and how other design elements all fit together. A QR (Quick Response) code is a barcode graphic that works with any smartphone. Just snap a picture of the code on your sign or ad and your phone will automatically take you to the website it points to. For example, a QR code on a real estate sign might point someone to a virtual tour of the house right on their cell phone! We offer a simple to use Free QR Code Generator to help you stay on the cutting edge of marketing technology. For any sign material not included in our instant pricing calculator, use this tool to receive a customized quote within the hour! With our Fast Free Quote system, you'll get quotes in hours instead of days and weeks. Your complete guide to frequently used custom sign-related terms and their definitions. This extensive Sign Term Glossary covers anything from types of sign materials to online design terms, and mounting accessories to sign-biz jargon! With our Live Design service, you can watch live as your design is being created in real time. Even if you're 2000 miles away! Get Live Support by phone (1.800.899.6272) or Live Chat, even after normal business hours. And on the weekends! How to Use Clipart and iStock Photo for Your Custom Signage. Do you need images for your new custom signage but don't know where to get them? We'll show you where and how! Applying vinyl letters and graphics may seem pretty intimidating at first. But we're here to tell you that the process can actually be quite simple! In fact, we'll even show you exactly how we apply vinyl graphics here in our very own shop! .Png, .jpg, .gif...are you confused by all of these file format names? If so, don't worry - you're not alone! We'll help you understand the difference between all these formats for the photographs, logos, and artwork you've selected for your new custom signs, help you discover what the best format for your specific artwork is, and we'll show you how to attach these images to an email! Where Do Signs Go Horribly Wrong? In this Special Report, you'll learn how to avoid the 3 most costly sign mistakes. This 13-point, step-by-step guide will show you the right way to go about designing your new business sign. Plus, it will help you avoid the most commonly overlooked design mistakes, we see over and over again. Why do sign companies only tell you the "good stuff" about signs? How can you make an informed decision with only half the facts? This guide will open your eyes with insider information never before revealed. You'll see "the good, the bad & the ugly" about all the popular sign materials. Are Your Marketing Headlines Missing These Precise Psychological Triggers? How to write compelling headlines that will grab your clients' attention every time. "Why should I care about writing headlines? ", you ask. Headlines aren't just for newspapers and CNN Headline News anymore. You can put the power of headlines to use right away in all of your marketing pieces including your website. When Sales Stop, Business Stops! So keeping your marketing engine humming along is kind of important. Let your foot off the gas for even a second and you could lose momentum. And that can be dangerous. Especially during these times of economic uncertainty. So here's a list of marketing options and ideas to ponder. This list is a great brainstorming and goal planning tool. It can help you clarify how you want to promote and grow your business. Are Your Business Solutions Your Biggest Marketing Problem? Sales and marketing professionals are often taught to emphasize the features, benefits and solutions their product or service provides. But how and when should you address your clients' most pressing problems? This eye-opening report turned my thinking about marketing upside down. And it's yours now just for the asking. If you've never applied vinyl letters before, the process can seem pretty intimidating at first. You don't want to "mess up" and get the letters crooked. Or even worse, botch the job so badly you have to buy another set and start all over again. Fortunately, we offer a "Goof Proof" guarantee for the vinyl graphics you get from TheSignChef.com. You'll be able to apply your vinyl lettering just like a professional -the first time and every time! 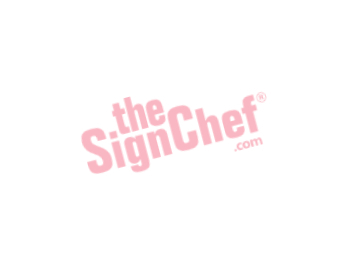 TheSignChef.com always offers free ground shipping on all orders, in addition to other savings and guarantees! We stand behind our work with a 100% Customer Satisfaction Guarantee. If you ever receive anything from our company that is defective in workmanship or different in specifications from what you ordered, we will replace that product free of charge and even pay the shipping!